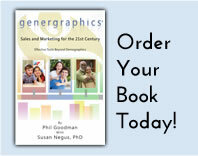 Genergraphics® is the brainchild of Phil Goodman who also holds a process patent on Genergraphics Web sites. Phil Goodman and Craig Carapelho have brought together their experience and expertise in order to develop a full array of Genergraphics marketing services including Genergraphics Web sites, advertising and product marketing, market research, and communications consulting services. To Phil Goodman and the members of his company, demographics are not as important as strategies based on the psychology of marketing. We refer to this as Genergraphics, but it's really keen observations and street-smart experience. Phil certainly has successful credentials. Since 1955 he has been deeply involved in advertising and marketing. In 1974 he started Western Media Corporation, a media and marketing firm specializing in the hospitality industry. Originally from the East Coast, Craig moved to Hawaii to attend the University of Hawaii where he graduated in 1991 with a Bachelor of Arts degree majoring in Marketing. Craig founded Team Vision in 1997 after working as an account executive at one of Hawaii's largest advertising agencies. Craig has extensive marketing experience that he developed working as some of Hawaii's largest advertising accounts such as Castle & Cooke Homes Hawaii, the Island of Lanai and Hyatt Regency Waikiki.